It's a busy week. Today I'm helping to setup the "Birds of a Feather" show at the Gates that I'm taking part in with an amazing bunch of ladies. 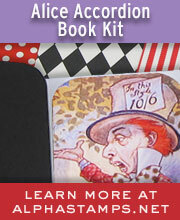 Saturday is our Open House / Mad Hatter's Tea. Sunday is Horizon's Homes, Garden, Music and Fairy Door Tour. I'm feeling overwhelmed and in dire need of a fairy godmother to do all the stuff I will forget. Because I'm so busy it makes complete sense that I'd squeeze in some extra projects. That's what I do. Procrastination through productivity of things that I aught not be doing. Here's one of the projects I did when I should have been doing 23 other things. 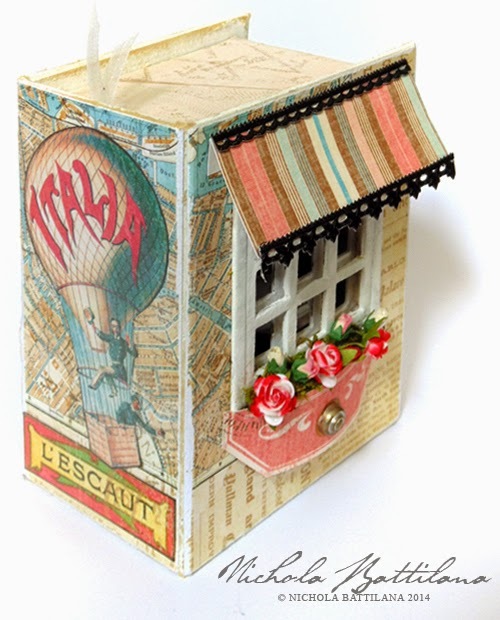 I've used a Graphic 45 ATC Book Box as the base. I love G45 boxes... they are incredibly sturdy! 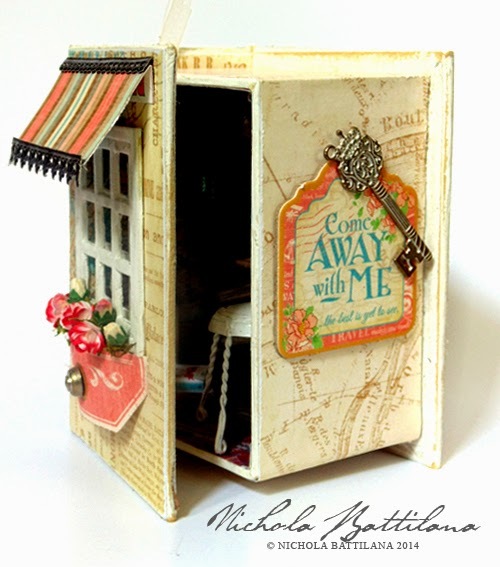 All of the papers used in this piece are from the Come Away With Me collection. 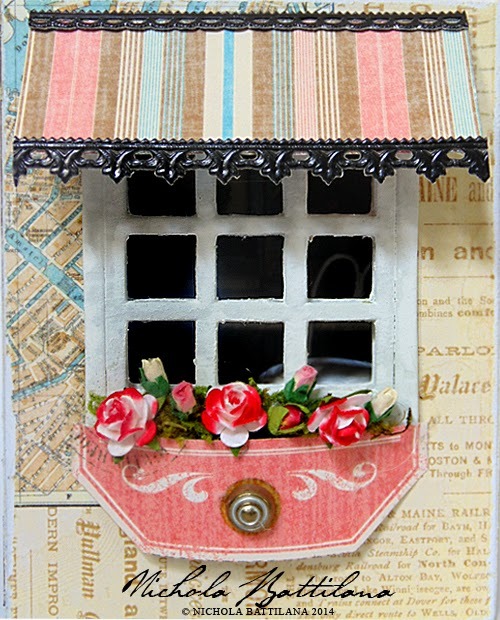 The window frame is chipboard from Maya Road, and the little flowers are Tiny Paper Roses and Mini Rose Buds from Alpha Stamps. I've accented the awning with some black dresden. But what IS it? A book nook! A teeny weeny reading spot for fairy folk to hide and sneak a cup of tea and few pages. As soon as I completed the larger Godefroy's Book Shop I knew I wanted to created a smaller, intimate bookish space. Inside there are stacks and stacks of tiny handmade books. A champagne wire chair and Miniature Potted Red Roses. Above, the little space all opened up. Below a quarter for size reference. Oh,,to have a place to steal away like this to read- the lil fairies who use this are sooo lucky! Awesome! I love this. 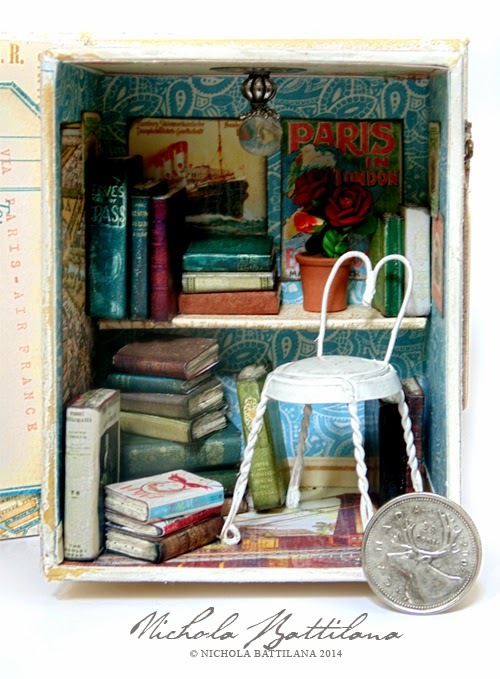 Your miniature books are amazing. Hint...any chance you can do a quick tutorial on how you make them, or did I miss one you already did, LOL. 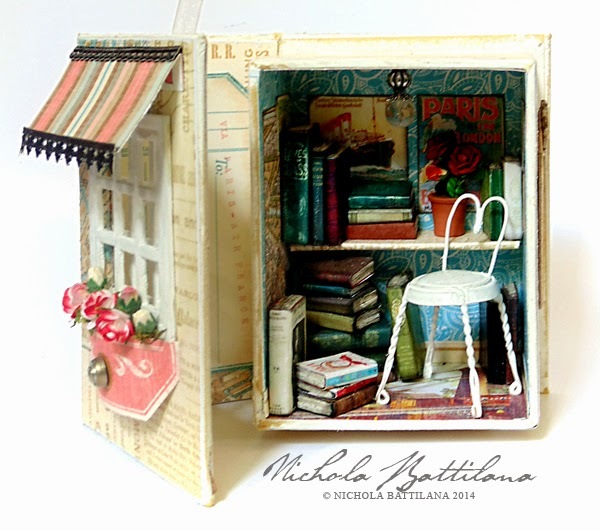 This little house is amazing and the detail, well as always its perfect. I love it. I just completely love it. 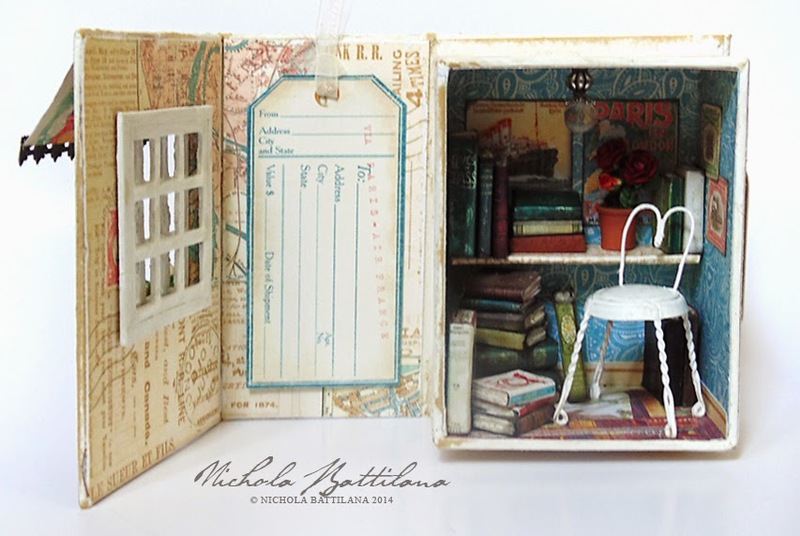 Love the minibooks and I wish I'm a litte fairy who can sneak in there and read in quiet and Peace. Thank you for sharing this wonderful idea. Yes, I would like to try to make one. Thank you, thank you.